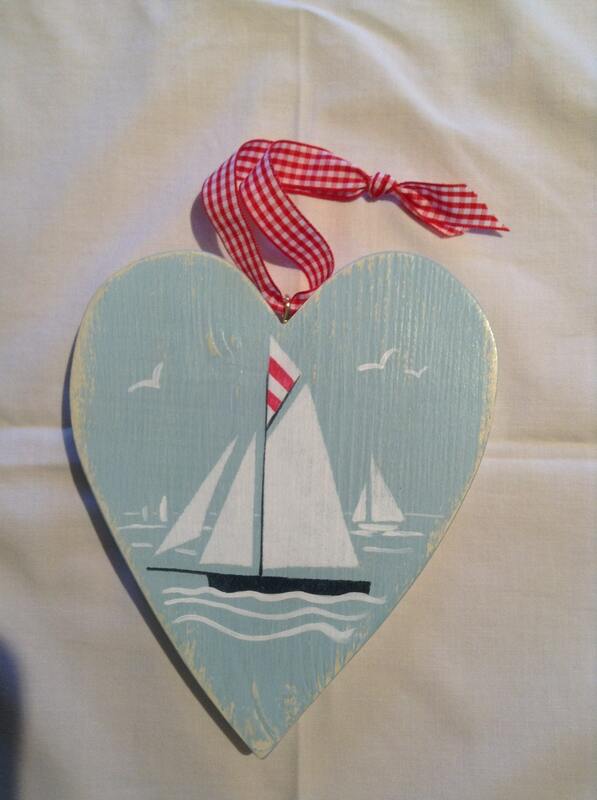 wooden heart, Falmouth working boat, hand cut and painted, coastal art, collectibles, nursery art, christening gift, made in Cornwall. Large heart. - Falmouth working boat. Inspired by the original ( and some still working ) oyster dredging boats in the Fal estuary. These magnificent gaff riggers race through the summer months in the waters off Falmouth and St Mawes. A distressed chalk paint finish is used, decorated with stencils and hand painted in acrylics. The front is then waxed. Complete with brass fixing and ribbon. Please choose from images- black hulled boat or white. Beautiful hand painted wooden heart bought as a gift to be cherished. Just beautiful! Bought these to decorate an alternative "Christmas" tree - with a sea theme - beautiful! Wooden heart, rabbit and bird.